Simple, sleek and svelte - the admittedly understated FLY is a versatile tool suited for both alpinists and ice fall climbers. The FLY's one piece pick/hammer component is held firmly between machined aluminum jaws for precise placement and zero vibration. Unique FLY BLADE has 3 specialized types of teeth to provide just the right "stick" and security for everything from hard brittle water ice to neve. For leashless ice fall climbing, bolt on the UPPER REST accessory to match hands and climb higher. For classic alpine routes the new FLY can be fitted with the RAPTOR PICK combos and used with CHOKE HOLD LEASH for self arrest and security. Over molded handle is fitted with a sticky ribbed grip and hand support - which can be removed streamlining shaft for snow penetration. 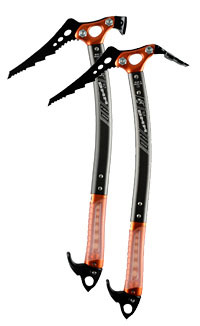 A good performer for any waterfall ice as well as a sensible low weight tool for mixed alpine routes. Made in Wales. Save on a pair... or add crampons and deduct 10% Package Deal; Super charge with 6 ice screws and lop 15% off individual prices.